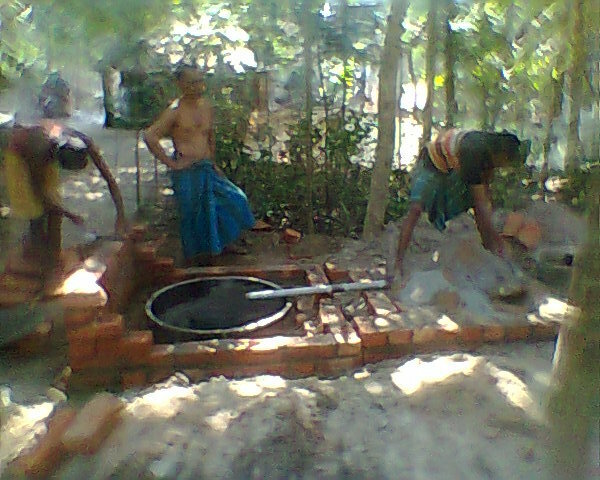 The new site for borewell #PW212 is in Hyderpur village of Baduria block of N 24 Parganas district. This land is donated by Arshad Mondol to the community to construct the bore-dugwell. 31st December: Boring and digging is complete. Housing is ongoing. CANCELLED SITE AFTER PILOT TEST. This site #PW209 is in Bajetpur village of Baduria block of N 24 Parganas district. This land is donated by Thakur Charan Mondol to the community to construct the bore-dugwell. We went to inspect the dugwell no- pw-209. Health meeting is ok. The poeple 15. Office attendance: Farida, Aparna, Shilpi. Picture is uploaded of the bore-dugwell being complete and in use. Picture of the construction being complete is still pending. The community will start using the well water after the arsenic report. Water has been collected for the arsenic analysis.